The Artisan of the Year category in our annual awards is an opportunity for me to personally recognise a bespoke maker, outside of the usual cycle of reviews and product launches. It is, in effect, an expanded version of the ‘Reflections on bespoke’ series. Last year the winner of the award was tailor Musella-Dembech, whose cotton suit I love so much. And this year it is shoemaker Gaziano & Girling. The first and primary reason I picked G&G was the reflection that, looking back over all my bespoke shoe commissions, at least two of the pairs they have made me are among my absolute favourites. The hatchgrain loafer that Tony Gaziano made me in 2012 might be my favourite of all time. It fits well and is made well, of course, with a holding of the ankle that I can never get with ready-to-wear, and that shaping of the waist and heel that you usually only get with bespoke. But two other points are subtler and probably more important. The first is the technical achievement of making a shoe without a seam. Not a wholecut with a seam at the back, but one circle of leather - stretched at the ends, shrunken at the sides - with no seam at all. Others can do this, of course, but I appreciate how much of a pain it is to do, and the fact that absolutely no one outside of a few shoe obsessives will realise that. Second, the style has both worked well and is rather distinctive. The hatchgrain texture leads to natural variation in colour, both because of the places it is stretched and the way polish cracks on the more densely hatched areas. And the style is elegant while remaining slightly casual. I can happily wear it with flannels and knitwear, but also sharp worsted trousers and a blazer. This is the style sweet spot for me and - as in many areas - I think the importance of style is one often underrated by fans of bespoke in favour of tiny making or craft points. Indeed, I think this is the biggest challenge for bespoke shoemakers going forward. 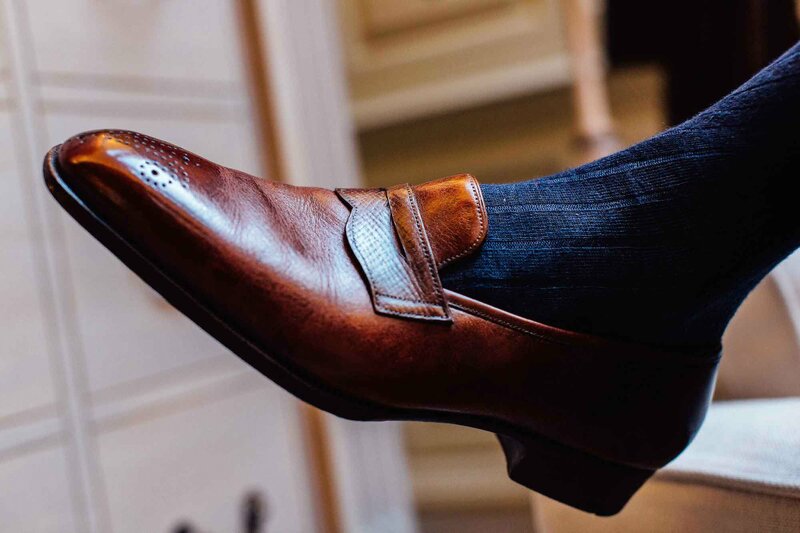 The extremely fine, dressy shoes offered by most bespoke shoemakers are going to have a fairly limited and shrinking market. 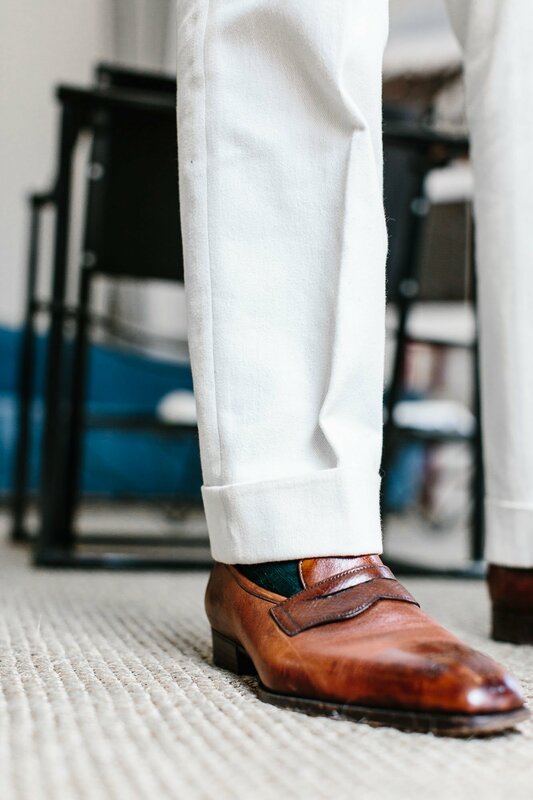 They need to also offer casual shoes like this that involve no less craftsmanship, but are likely to be worn with more than just a worsted business suit. Of course, handwork generally makes more of a difference to dress shoes than flat-soled casual ones. But there are always points where that handwork can add value, like a hand-sewn split toe or double sole carved down to one sole at the waist. The other two pairs of shoes Gaziano & Girling have made for me are not quite as versatile. 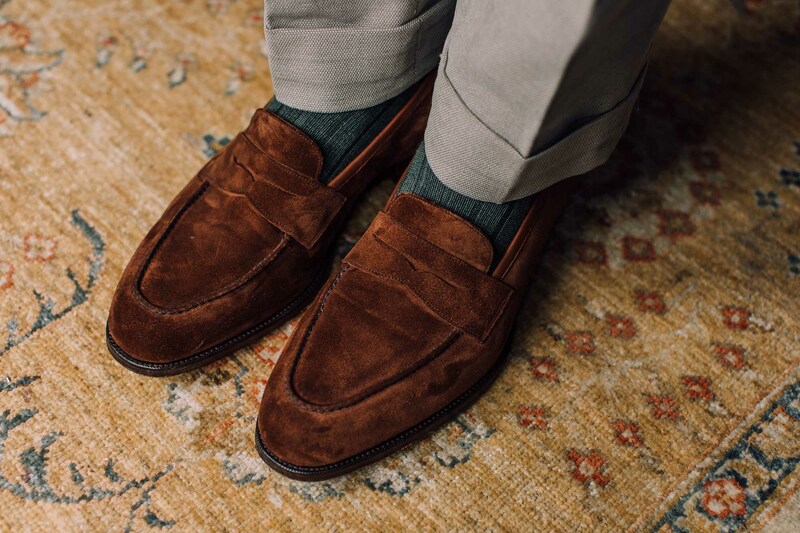 But the adelaide shoe (above) is still a fairly useful everyday brown oxford, and the fineness and chiselled nature of the loafer Daniel Wegan made (below) is balanced by its casual brown suede. The second reason for picking G&G this year is I think their story deserves regular recognition - and it’s easy to forget it. 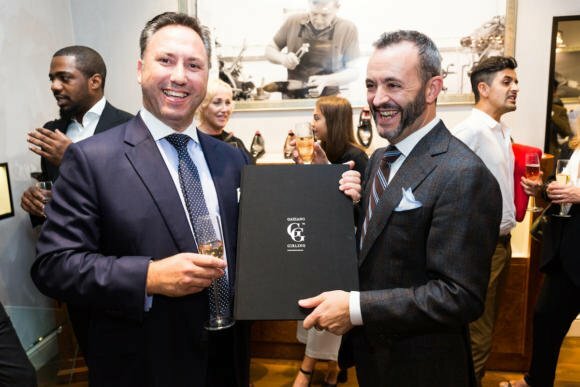 Tony Gaziano and Dean Girling started their company from a garage, first made bespoke shoes, then produced ready-to-wear in someone else’s factory, then opened their own factory, and then opened a shop on Savile Row. It is, in many ways, the perfect trajectory for a craft-based classic-menswear company. It’s what we all want from the makers we love - and G&G have done it. Along the way they’ve made shoes for many designer brands, and collaborated with others - which frankly both elevated the quality the brands offered and demonstrated what great value G&G is. 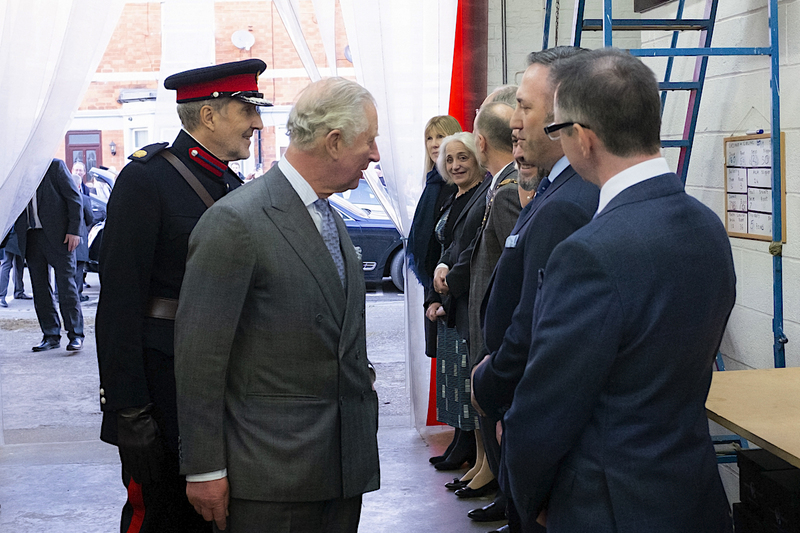 The arc of the G&G story probably reached its peak this year, when Prince Charles visited the factory in Kettering, as part of a tour recognising the old (Tricker’s) and the new in England's shoe heartland. G&G’s recent launch of a ‘Classic’ range can also be seen as a stage in their development. When G&G launched their ready-to-wear, it had to be something different to stand out in a crowded market. The headline was bespoke-level materials and craftsmanship, but the last shapes were also different for an English maker - elongated and chiselled. Deco, which came a few years later, was even more extreme. Today, Gaziano & Girling is a bigger brand with a shop that many tailors of the Row send their customers to. It makes sense that the offering is broader. The Classic range does that, by using a more traditional last shape, a lower heel, and by taking out some of the more time-consuming bits of make, particularly around the waist. 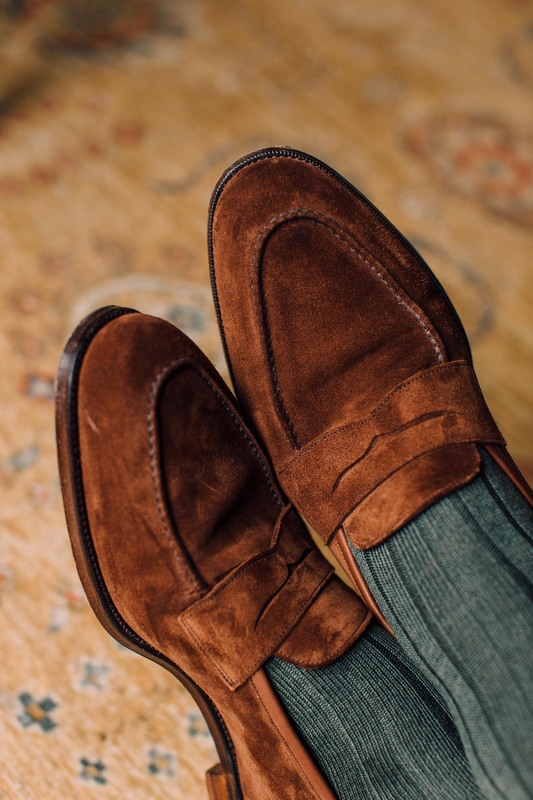 Pictured here is the Chadwick in polo suede, one of the five styles in the range that also includes a cap-toe, half brogue, full brogue and chukka boot. The whole team at G&G richly deserve this award, and I hope highlighting their story reminds us how far they’ve come. 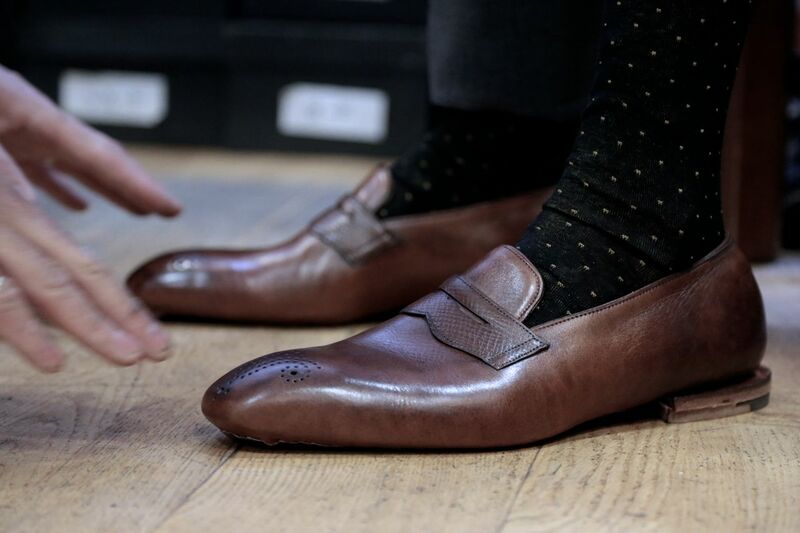 I should also say that the seamless loafer is now available as a ready-to-wear shoe from G&G, called the Crompton. I feel very honoured Tony and Dean decided to name it after me, but of course I did nothing - the entire credit goes to Tony. Photography: Jamie Ferguson @jkf_man except numbers 2, 5 and below, Luke Carby. And Prince Charles photos, Gaziano & Girling. Although the Crompton is named after me, I receive no commission or similar from its sale. Want to learn more about Permanent Style’s commercial relationships? Read here. You can follow the discussion on Artisan of the year 2019: Gaziano & Girling (or, the ideal artisanal journey) by entering your email address in the box below. You will then receive an email every time a new comment is added. These will also contain a link to a page where you can stop the alerts, and remove all of your related data from the site. Those Chadwick loafers looks truly amazing , rich and lustrous suede. Very nice pairing with the green socks and taupe (stoffa?) trousers too. I’ll be saving that for the upcoming season. Yes, Stoffa trousers. Review of those coming soon. And yes, the colour of that suede is particularly rich. Simon, those Chadwick loafers are spectacular indeed. Hopefully that model will be offered in other colors, both suede and leather, at some point. Ive have been a fan for a while so whole hartedly agree. I brought my first pair from tyem when they were in the Basment sharing space with C&M. When funds (and kids) allow i will be back for a bespoke pair. Those were the days. With Joe vaguely waving people towards the shoes – it was basically self-service. First time I went i must have walked past about 4 times before i was sure i was in the right place. The sales guy was a French chap, he was outside having a smoke so I browsed whiost he finished it. Brought a pair of dark brown Kensingtons. It was basically MTO without the mark up. Love the reminiscences about the early days of G&G down in that C&M basement – with no sales person! I was knocked out by their style (classic but just that bit edgier and more interesting than most EG etc) and the possibility of MTM. Second time I visited Tony Gaziano was there – so friendly and helpful, and told me about their ambitions to develop the fledgling business. I ordered the Gable and must have been one of their very early orders. It’s still going strong (with a resole along the way) 12 years later. Prices have gone up a bit since those days! However, I’ve remained a customer ever since and consider their ‘shop floor’ service to be the best I’ve ever encountered, along with a couple of clothing stores such as Anglo Italian. When you’re paying serious cash, being treated more like a friend than just another customer makes such a difference. I’m so pleased to see the success and Royal recognition that Dean and Tony are now achieving. On a more general point how did you climb the ‘shoe ladder’? Nice question. When I was 20, it was Jones. They were terrible. Then it was Lodger (no longer exists) which had shoes made by Cheaney and Crocketts. There was a phase when I was obsessed with Berluti, and bought two pairs over the years. Then it was Edward Green via Ralph Lauren. Because RL had more regular sales so you could get the shoes cheaper. Then again an infatuation with French shoes, this time largely Corthay. And then a settling back into the English options, Edward Green and G&G, plus the bespoke forays. There’s a longer blog in that reply. Yes, that used to be a bigger mainstay of all Northampton shoes until margins started being squeezed and the manufacturers realised they could sell directly to customers more easily through e-commerce and social media. Lodger also had their shoes made by Alfred Sargent. What happened to Lodger? They had a nice store near the row and made a big thing of oxblood shoes and a machine that measured your feet. Then suddenly they were gone. A worthy winner. I bought a couple of G&Gs when they were the latest hype. 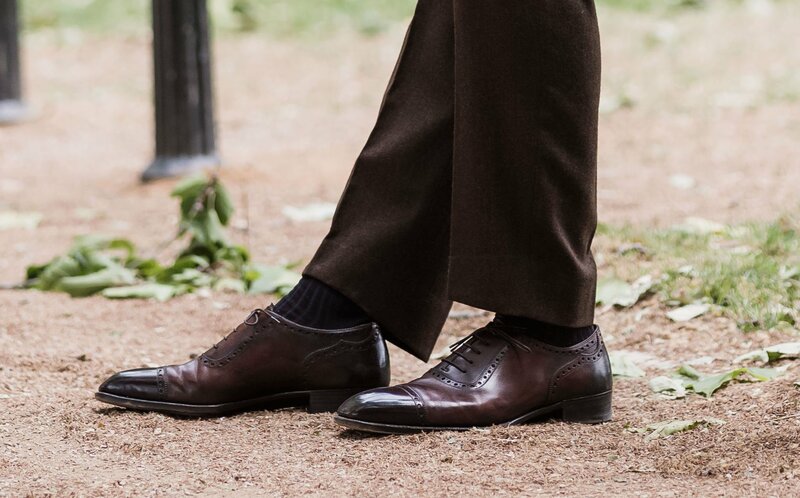 I especially like the Gable (cap-toe with a twist) and the Burnhamn (wholecut chelsea). I have since then bought more conservative makers (mostly EG and St Crispins). But the new classic line is very nice and I bought the derby brogue that is a very nice and beautiful shoes. I had a pair of C&J Pembroke which I never really liked (the tan brown was too light and it was not elegant at all). The G&G version of the derby brogue is much nicer. 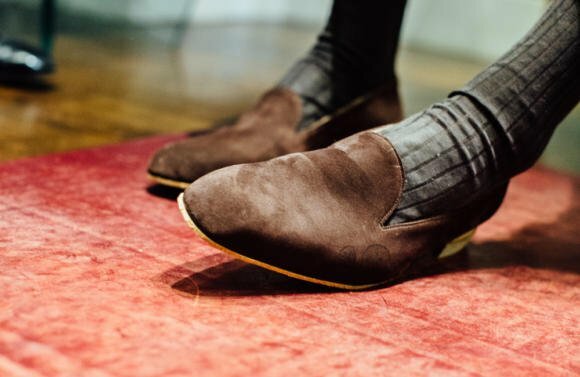 Those brown suede shoes look especially beautiful. Slightly off topic, but do you have a post on which brown shoes (light or dark brown) to wear depending on the outfit? Leaving aside considerations of formality (i.e., dark brown more formal than light brown), I sometimes have a hard time deciding which brown shoes to wear with which sports jacket. I remember reading something in the past here but it might be in one of the comments. By the way, what do you think of oxblood colored shoes? I’ve mostly seen it with jeans, but the other day, I saw someone in my office wear it with charcoal colored trousers, and it seemed to work surprisingly well. On oxblood, it depends a lot on the shade, but it can be nice. If it’s pretty close to black, then it’s a question of whether it’s subtle enough to really look like black unless you play close attention. If it’s lighter than that, more like Colour 8 Cordovan, then I find it can be really versatile, though maybe best with blues and greens – denim, navy flannel etc. 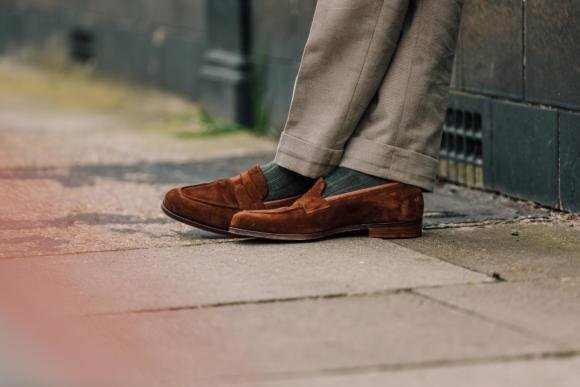 Brown shoes don’t need to be darker than the trouser if suede. Sorry this is again off topic, but while we’re on the subject of color, do you think about alternative colors? For instance, many shoe companies are starting to sell men’s leather shoes in navy blue / dark navy. In theory, navy/slate/dark blue leather shoes would go well with grey flannel trousers, for many men, grey trousers and sports coat is almost a uniform. I see women wear navy colored leather shoes all the time, which suggests there’s nothing wrong with the color combination per se. But I rarely seem men wearing navy shoes, so it strikes me as a bit out there. I guess it depends on the type of shoe? (E.g., it might be easier to get away with wearing navy suede loafers than navy blue wingtips or double monks, and easier to get away wearing navy wingtips/double monks than navy oxford cap toe shoes). I find it’s often a mistake to think colours apply uniformly to different types of menswear. You would happily wear a pink shirt, but not a pink jacket. Or a scarlet handkerchief, but not a scarlet shirt. In the same way, shoes are not the same as tailoring. Navy works with very little as a shoe – I had a pair from Lobb I had for years and never wore. Rather like those guys who get a royal blue suit because they think navy is boring, getting a navy shoe is missing the point of classic menswear. It’s about the cut and make, and how you put everything together, not about unusual pieces. Sorry that became a bit of a rant! Thanks, that makes a lot of sense. Often, I have a sense that something doesn’t work but I’m not sure why. These posts and follow up comments are insightful! As an aside, it might be useful to make comparisons with women’s wear. From what I can tell, some rules are objectively grounded (e.g. on color theory), while others are more of a matter of convention. E.g., women rarely wear brown leather pumps, while for men, brown is the most commonly used shoe color. I guess an explanation might be that for women, the shoes or purse can be the focal point of an outfit (e.g., black dress with bright red pumps) but that is rarely the case for men. I too have a pair of navy Lobbs(lace ups) and never wear them! The model is fantastic, but the color is difficult to work with, at least for me. Any suggestions? Thanks. I don’t see navy belts offered much, if at all. Would a black belt work reasonably well? By the way, aside from aesthetic considerations and appreciation of fine workmanship, it would be interesting to have a post for what type of people would benefit most from bespoke shoes. E.g., not sure where the problem lies, but I have a really hard time finding loafers that fit: if they fit in the front then the heel pops out as I walk. And if the heel fits then the shoes are inevitably too tight in the front. I’m not sure how common this problem is but it is pretty frustrating. It’s very common! I have it and I think most people with narrow heels have it too. Partly that’s just loafers for you. There’s no ability to play with the tightness across the foot, so only for a smaller proportion of men will they hold the foot perfectly. Have you tried stretching shoes that are just slightly tight in the front? C&J addressed this very point with their 325 last. On their Cavendish, they tightened the heel and called it a 327 last. Surprised that you wore Berluti and Corthay (I still do, for the most classic ones); your taste in clothes must have been pretty different then. I would have initially looked for a more rounded last in loafers but I could very well change my mind with that suede pair. I was surprised at G&G’s prices for RTW; they look to be halfway between the likes of Crockett & Jones and say, Edward Green. Would that middle position be reflected in the materials and production, Simon? Not the materials, but the production, yes. I mentioned it in the piece – you’re not getting the extra handwork in the waist for example, that initially set G&G above all the other classic shoemakers when they launched. But you’re getting the same materials, and work as Lobb or Edward Green. So very good value. Thank you, Simon. Certainly worth considering that bit extra then. Thank you for this post. G&G really deserve this recognition. They also happen to be one of PS readership’s closest mainstay in the shoe industry. It’s absolutely stunning how they have contributed directly or indirectly to shaping our tastes – whether we are aware of it or not – with respect to shoes. Equally startling is how they have kept moving alongside our own journey and sharing our fortunes, while upholding their commitment to craftsmanship. Just wondering if you choose to purchase shoes for a specific maker based on the type of shoe / desired look? For example, would you, say, buy a pair of oxfords from G&G but boots from Edward Green and so on? If so, how do you make your choice? I’m thinking about a pair of top drawer monk straps from EG myself, but am also considering a MTO from G&G. Where I live, it isn’t possibly to physically try the shoes on. Thanks for the reply Simon. If you don’t mind commenting, how do GG MTO compare to EG Top Drawer in terms of last design, leather, and overall construction? I assume you find them more similar than not, given that you are willing to purchase shoes from both companies. Simon, would you put Lobb in this group concerning similarity of the quality of construction and materials? I was very closed to commissioning a pair from them, but their bespoke prices kept increasing regularly. By the way, would you consider doing a guide to shoe styles to go alongside your guide to suit styles? Thanks! I am getting married in a few weeks and want to get a serious serious shine on the toe of my oxfords, something beyond my ability. I have seen online someone who calls themselves the Jaunty Flaneur who works out of Cad and Dandy on the Row – will they do? Or anyone else you would recommend for top quality work in this area? They would certainly do very well. Tom at the Jaunty Flaneur can set it up, but it would be PJ in the shop there that would do it. Phone him up and make an appointment – I think he’s there Tuesday to Thursday from 11 if I remember right. Thanks. If you know of anyone else in London that would be highly useful!! Off topic: but what fabric are those white trousers made of? Wool by any chance? They look great. I’ve been searching all over for pure-white, pure wool and have had no luck. Any pointers would be greatly appreciated. No they’re cotton I’m afraid – if you look up the post on P Johnson you can find details there. I do hope HRH is sufficiently taken with their excellent product that he gives Tony and Dean a Royal Warrant. 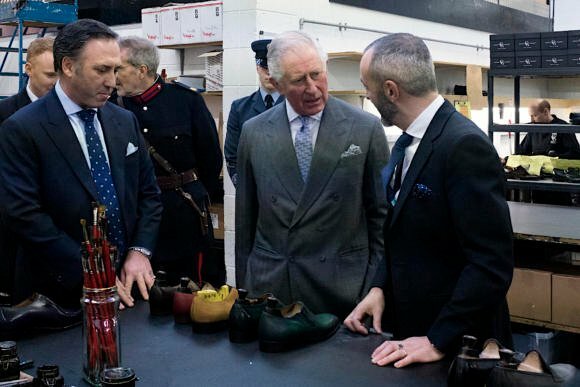 They deserve it (I was impressed with the care they take to get the last and fit right, including making a trial shoe – unlike some other more traditional bespoke makers who seemingly now rest on their laurels). Simon- the G&G Chadwicks in polo suede don’t have that same rich look when I look at the shoe on their website. Any reason to think they’re not the same?